My new fave fragrance? Vera Wang Glam Princess Eau de Toilette. Everything from the chic heart-shaped bottle to the flirtatiously brilliant scent has drawn me in from the very beginning. To begin with, the star-bedecked bottle is so adorable yet feels completely adult. I love the miniature jeweled crown stopper atop the bottle as well -- because, let's face it, who doesn't want to feel like royalty from time to time? And the scent? So delish. Notes of guava, pear, honey, vanilla orchid, marshmallow orchid and cedarwood create a fragrance that's at once beautifully sweet and surprisingly sensual. And at the end of the day, that's exactly what I've been looking for! 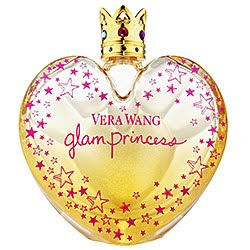 Vera Wang Glam Princess Eau de Toilette retails for $45-$72.